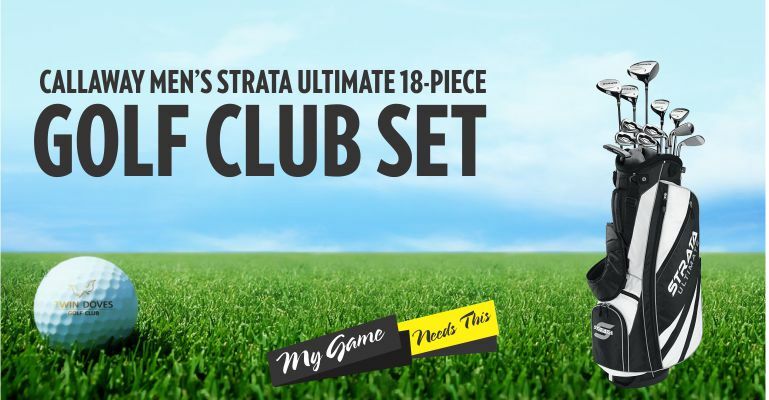 Callaway Men’s Starta Ultimate (18 Piece) is first set on our list is brought to us by Callaway, one of the best-known brands In the Golfing world. They specialize in Golf equipment and have done a brilliant job of keeping up with customers needs and always offer their products at a competitive price tag. This 18-piece Golf Set does not drop in standards and is one of the best-selling Golf sets for Beginners that you can purchase. There is also a 12 piece version of this collection available should you want to save yourself a bit of cash, or simply don’t think you’ll need all 18 Clubs! Although we would recommend getting the 18 piece version simply because you never know when the spare clubs may come in handy. Driver- This collection comes with the 460cc Titanium Driver, you’ll be able to make some sweet shots at the start of your game with this Club. Although there are better drivers out there this is a great starting point for anybody who is new to the sport. Fairway Woods- You will receive two different Kinds of woods in this bag, these are the 3-Wood and the 5-Wood. Both have durable Steel heads that should stay in good condition for a long time; each club also has a rather large face which means you will be able to find the perfect hitting spot for you and blast the ball down the Green. This is a great way to improve your accuracy as you have to learn which part of the face will deliver you with the greatest shot! Putter- The Callaway Men’s Strata comes with the Strata Putter (if that comes as a surprise). This has a nice feel and should give beginners confidence whilst they’re trying to line up that all important shot. Callaway has done a great job of balancing the weight on this Club as well which can only benefit the user. Irons- You get your fair share of Irons in this 18-piece bag. There are 5 in total (plus one Sand Wedge). These go from the 6 iron all the way to the Pitching Wedge and are probably classed as the most important part of the collection seen as they will be the most used Clubs. Again Callaway has done an amazing job of making these clubs perfect for beginners. They have done this by making sure the ‘sweet spot’ on each club is bigger so that you can, therefore, get a more accurate shot each time. Although Wedges are classed as Irons they are a completely different component to your game and we are happy to see that Callaway has included a Sand Wedge. Hybrids- Many people underestimate just how good a Hybrid club can actually be; there are two included in this 18-piece set. Both of these are great replacements for the Irons which were missed out (3-5). You will be able to get a nice and accurate shot off of the fairway and rough with ease and should feel happy when going for a shot with either of these best Hybrid clubs. One of if not the best value for money set out there. It will be difficult for you to find a better quality, 18-piece set at this price. Some of the clubs have been specifically tailored for newcomers to the sport. This ensured that beginners will have the best possible experience when using this collection. The Clubs themselves are really impressive, The driver has a massive sweet spot, the woods have a large face and Callaway seem to have done everything in their power to make this Club accessible for new players. The irons are also great and we are happy to see that Callaway included a sand Wedge as many beginners struggle when trying to get the ball out of a Bunker. We actually found it quite difficult to find anything wrong with this bag; especially when you consider the price tag. There are a couple of options that include more accessories and may be slightly comfier but that’s about it. Callaway has done a great job of producing a high-quality great value for money Beginners bag. 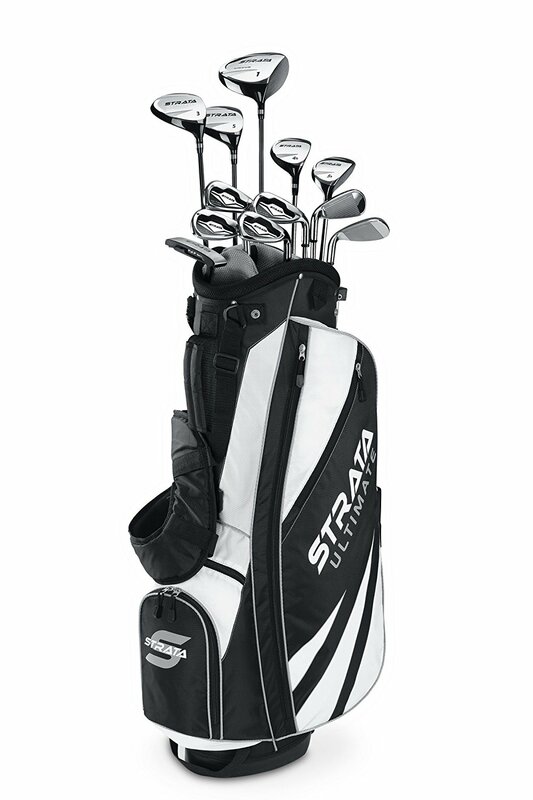 If you are a newcomer to Golf, have no equipment and want to have the ability to play a full game with all of your own pieces then the Callaway Men’s Strata Ultimate Golf Set could be perfect for you. There is no doubt that this fantastic collection is one of the best on the market, especially if you’re on a smaller budget! We hope you have found this review helpful but make sure you read some of the other reviews before making a final decision, there might be something that catches your eye.